What is it: An adventure game about exploring an unfinished adventure game. The Magic Circle casts you as a playtester for a game that has been in development for ages and is still nowhere near completion, something most gamers can easily grok in this age of Kickstarter campaigns and Early Access. What began as a sci-fi game has become a swords and sorcery adventure, and as you progress through the unfinished world you'll find the spines of a pixelated space station poking through the fantasy crust, with long-forgotten robots and drones mingling amongst the wizards and giant spiders. Before long, you'll gain the ability to make changes to the game by tampering with its programming. Specifically, you can alter the behavior of the game's entities. After trapping a hostile dog-creature, for example, you can change its alignment from viewing you as an enemy to seeing you as a friend. You can assign it new enemies, which it will then attack. You can also completely strip it it of attributes, leaving it inert while storing those properties in your library to be applied to other creatures. None of this involves writing code yourself, mind you: it's accomplished by simply selecting words from a list and dropping them into fields. You can't use these abilities directly, so overcoming obstacles becomes a matter of altering the behavior of your growing menagerie. Rocks can be made to float in the air, providing you a nice stepping stone. Zombies can be made fire resistant, rats can be fitted with tractor beams, and melee attacks can be written into the code of otherwise benign mushrooms. This gives you multiple ways to tackle obstacles, solve puzzles, and defeat enemies. It's also a lot of fun to play with between puzzles: who could resist sending a loyal army of mushrooms fitted with helicopter blades and repulsor beams to attack a few fire monsters? You're not the only human in the game: the developers, represented by floating eyeballs, are working on it as you play, though most of their work amounts to them bickering loudly with each other. As you might expect in a game about an unfinished game, The Magic Circle contains a lot of jokes about crowdfunding, development, game tropes and and games media, and provides some insightful and funny observations on those fronts. While the tone is initially light and playful, however, the writing eventually sags under its own weight. The performances grow melodramatic and overwrought, and there are long stretches where the developers argue or a rogue A.I. speaks to you while you simply sit there, waiting for them to finish (during Early Access, the ability to skip a couple of these scenes—though not all of them—was added). There are a couple of other issues: for a game in which you'll be crisscrossing the landscape repeatedly to explore, it's annoying that you can't sprint (though fast-travel is possible between scattered nodes). And while it fits in with the premise that the game world is visually unappealing, it doesn't really help the fact that the game world is visually unappealing. Throwback graphics can often be charming, but that's not the case here. You can expect between 4-6 hours of play, and after completing the story there's a relatively enjoyable minigame that becomes available. You can also continue exploring to find secret areas, audio logs, and anything else you might have missed. 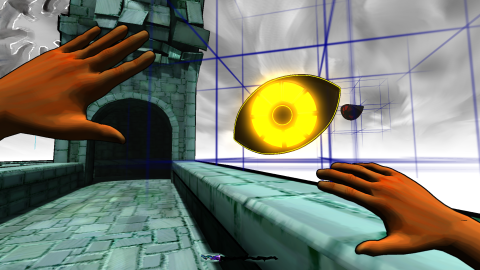 Despite its issues, The Magic Circle’s concepts are both clever and put to good use, and editing monsters to solve puzzles is enjoyable throughout.